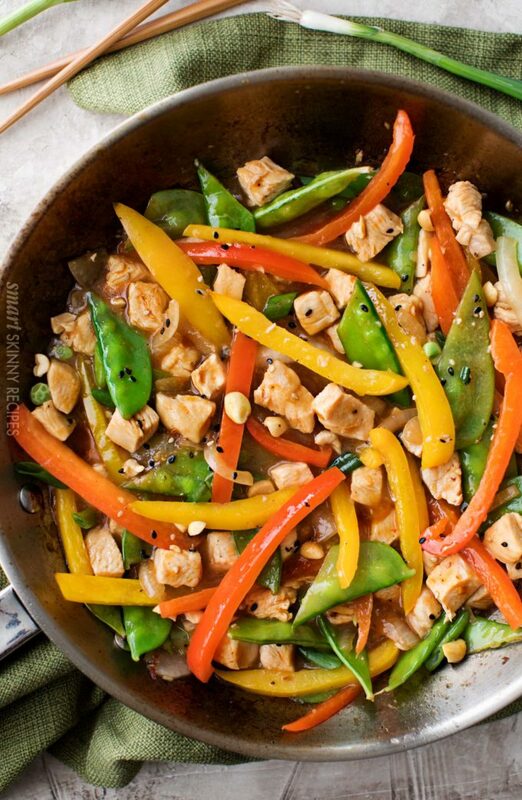 So simple to make, this szechuan-style chicken stir fry comes together in just minutes, is full of flavor, and is only 5 smart points per serving! 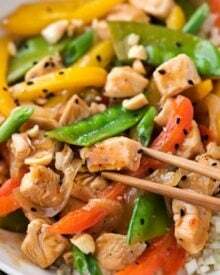 This Szechuan-style chicken stir fry is a go-to meal on a busy weeknight, as it takes just 20 minutes to get on the table, including prep time! Stir frys are one of my favorite go-to’s during the week, since by nature, they’re quick cooking! The downside with stir frys is that they can use a lot of oil, which racks up the points pretty quickly. 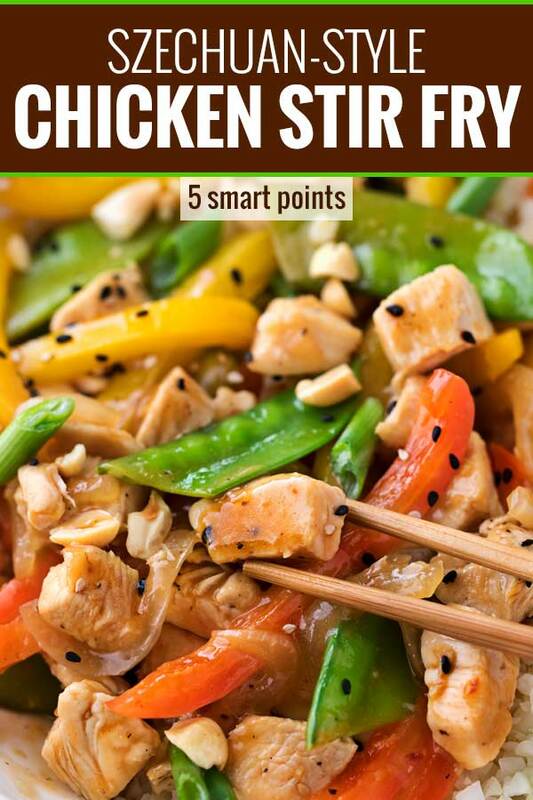 For this version, I’ve used less oil, and stuck with zero point foods as the base (like chicken, bell peppers, onion and snow peas), which keeps the points at 5 smart points per serving. If you’d like it to be even lower, there are a few options down below! Isn’t that so pretty and colorful?! I love “eating the rainbow” as it really is a great way to eat healthier without really trying. 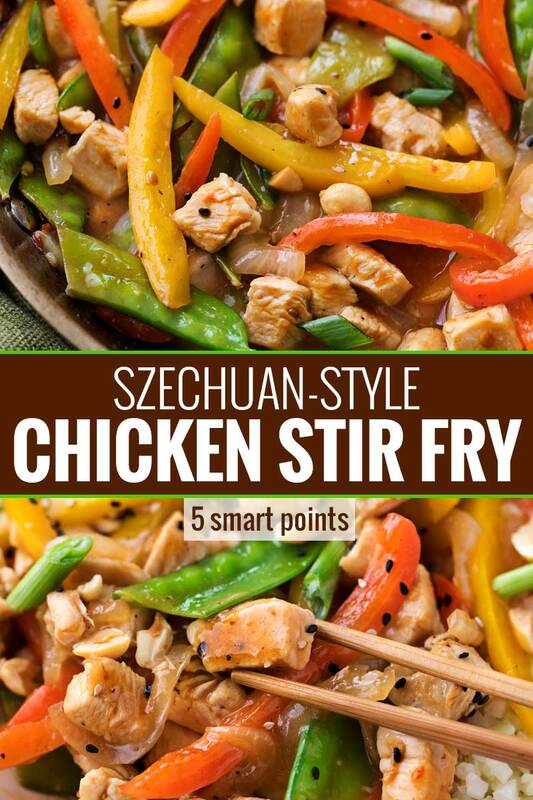 I classify this recipe as “Szechuan-Style” instead of just Szechuan, because I know it’s not 100% authentic. But even this American-ized version still has plenty of great Asian flavors, thanks mostly to garlic, ginger and sambal oelek. 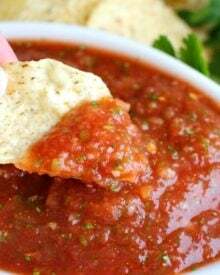 If you do much Asian cooking, you’re probably familiar with it, but it’s essentially an Asian chile sauce made from hot red chile peppers, salt and usually vinegar. 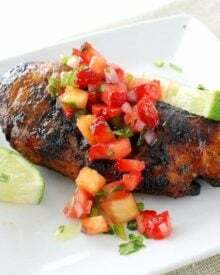 Some versions can also contain onion, lemon or lime juice, garlic, or sugar as well. Most grocery stores will carry it in the Asian foods section. My favorite brand is Huy Fong. 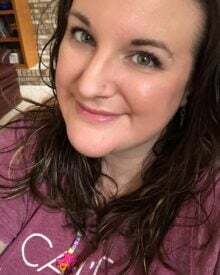 Usually not very long at all! Generally about 7-10 minutes is all it takes. 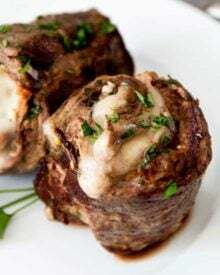 This recipe, including the prep time (most of which can be done ahead of time) takes about 20 minutes. Perfect for a busy weeknight! Prep ahead when you can. 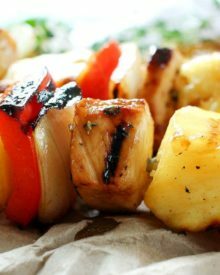 If you dread chopping vegetables or chicken, get it out of the way, and you’ll cut the total time on this recipe down significantly. Chicken, onion, peppers and snow peas can be chopped up ahead of time and refrigerated (keep the chicken in it’s own container). Scallions and peanuts can be chopped and kept in airtight containers. 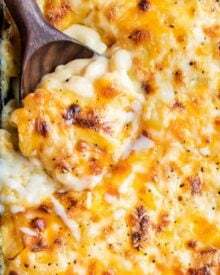 Even the sauce can be whisked together (just leave out the cornstarch and add it as you’re cooking the recipe). I love using cauliflower rice since it tastes great and is a zero point food. You can make your own, or use my secret weapon… most frozen vegetable companies are now offering frozen cauliflower rice! Pop it in the microwave to steam for several minutes as the stir fry is cooking. 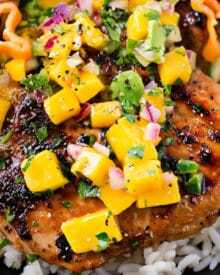 If you prefer a bit of sweetness to your chicken stir fry, you can add a drizzle of honey to the sauce, but that will effect the points per serving. 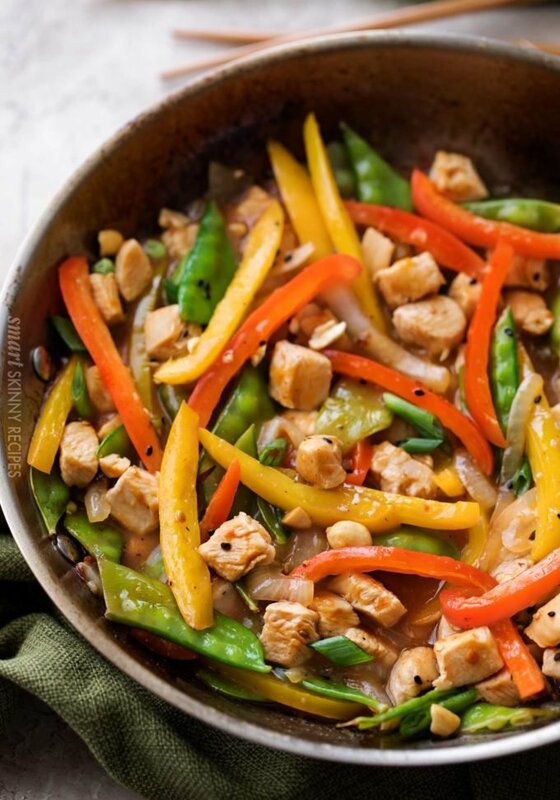 Use a big skillet (or wok if you have one)! You don’t want to overcrowd the pan when you’re cooking the chicken or veggies, otherwise they’ll sort of steam instead of sautéing. Full disclosure, I didn’t test any of these or run them through the nutritional calculators, so you’ll have to do that if you try one of these methods. Large stainless steel skillet/pan – This is a quality skillet that I use quite a bit… it has so many uses! My new wok (haven’t tested yet, but will be soon!) – I can’t wait to test this baby out, but the reviews on amazon are spectacular! No wok ring needed! To a small mixing bowl, add 1 tsp sesame oil, chicken broth, soy sauce, rice vinegar, chili paste, cornstarch and salt. Whisk together and set aside. Add remaining 1 tsp sesame oil and 1 Tbsp canola oil to a large skillet or wok and heat over MED-HIGH heat. Add chicken pieces and cook for 2 minutes, until lightly browned. Remove to a plate. Add remaining 1 Tbsp canola oil to skillet and add bell peppers, peas, and onion. Cook for 1 minute. Add ginger and garlic and cook 30 seconds. Pour in broth mixture and cook 30 seconds to a minute. Add chicken back to skillet and cook 3-4 minutes, until chicken is cooked through and sauce is thick and rich. Top with green onions and chopped peanuts. Serve over riced cauliflower. 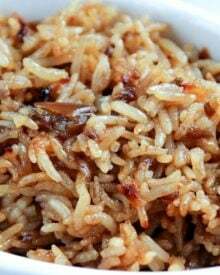 Can be served over white rice instead of riced cauliflower, but that will increase the points value. What if we added more veggies like broccoli zuchinni and squash along with those same veggies do you think more cornstarch and sauce is needed to make more sauce and more of a thickenong agent? One question? You add onions in step 3 and Step 5? Thank you 🙂 The onion is step 3 is the yellow onion, and the onions in step 5 are the green onions for garnish. This looks like the perfect!!! Love Szechuan flavors! This looks amazing! 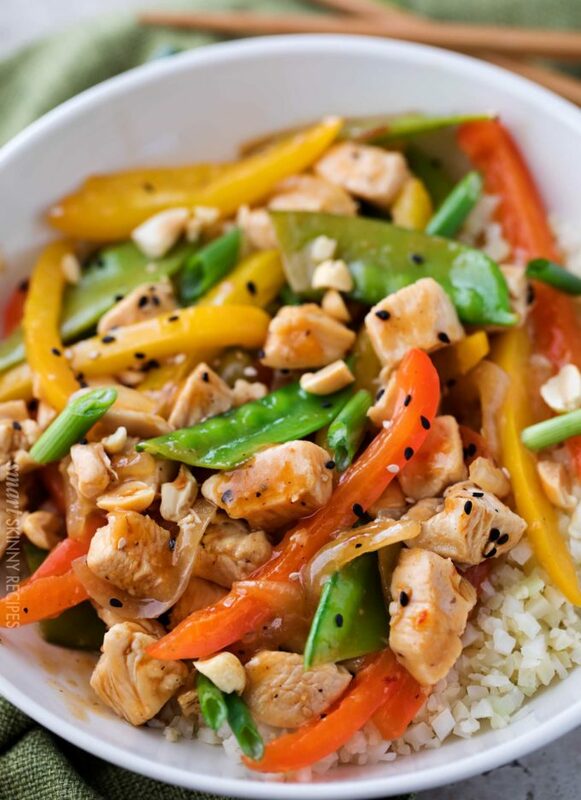 This stir fry is to easy and so tasty! The whole family loves it! I love all those veggies! I love how colorful this stir fry is! 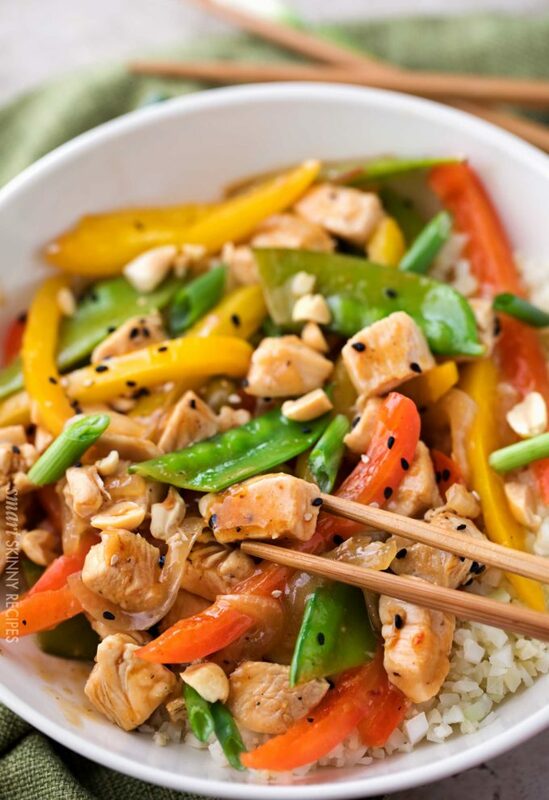 I like stir fries too, this looks amazing!